Ctenosaura pectinata, the Mexican spinytail iguana, is an herbivorous lizard which reaches a maximum size of 750 mm. In Mexico, it occurs along the Pacific coast from southern Sinaloa to the Isthmus of Tehuantepec, occupying rocky hillsides and, occasionally, trees. There are a total of nine species of Ctenosaura, ranging through the lowlands of Mexico and Central America as far south as Panama. Within this lineage, C. pectinata is thought to be most closely related to C. acanthura (Northeastern spinytail iguana) (de Queiroz, 1987). Ctenosaura is not uncommon in museum collections, and its cranium is relatively large and not highly specialized. For these reasons, it is a choice species with which to introduce students to the cranial anatomy of squamates, and the CT imagery presented here, in conjunction with the fine monograph of Oelrich (1956), serves as an excellent starting point. Ctenosaura is a member of Iguania (see also Phrynosoma), one of the two major squamate clades (the other being Scleroglossa, including Varanus and Shinisaurus). Within Iguania, Ctenosaura resides in Iguanidae, the clade that includes chuckwallas (Sauromalus) and all other iguanas (see also Dipsosaurus dorsalis, the desert iguana). Diagnostic features of Iguanidae include the position of the parietal foramen in the frontoparietal suture, the fusion of Meckel's groove, and the absence of palatine teeth (Frost and Etheridge, 1989). This specimen is a subadult, as indicated by the incomplete fusion of the braincase elements. It was made available to the University of Texas High-Resolution X-ray CT Facility for scanning by Dr. Chris Bell of The University of Texas at Austin. The specimen was scanned by Richard Ketcham on 18 February 1999 along the coronal axis for a total of 482 slices, each slice 0.155 mm thick, with an interslice spacing of 0.155 mm. de Queiroz, K. 1987. Phylogenetic systematics of iguanine lizards. University of California Publications in Zoology 118, 203 pp. Frost, D. R., and R. Etheridge. 1989. A phylogenetic analysis and taxonomy of iguanian lizards (Reptilia: Squamata). University of Kansas Museum of Natural History Miscellaneous Publication 81, 65 pp. Oelrich, T. M. 1956. The anatomy of the head of Ctenosaura pectinata (Iguanidae). Miscellaneous Publications of the University of Michigan Museum of Zoology 94, 122 pp. Smith, H., and E. H. Taylor. 1950. An annotated checklist and key to the reptiles of Mexico exclusive of the snakes. Bulletin of the U. S. National Museum 199:73-75. 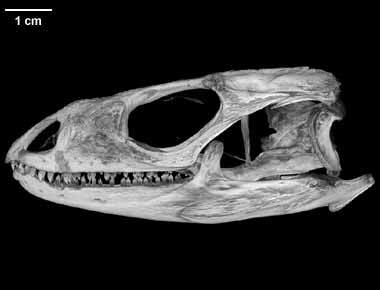 To cite this page: Dr. Jessie Maisano, 2001, "Ctenosaura pectinata" (On-line), Digital Morphology. Accessed April 19, 2019 at http://digimorph.org/specimens/Ctenosaura_pectinata/.